Name of a district, or districts, in Arabia. According to I Sam. xv. 7, Saul smote the Amalekites from Havilah to Shur (the region of the "wall"), "over against Egypt"; the Ishmaelites are also placed in the same locality (Gen. xxv. 18), which will thus correspond with the northern part of Arabia, the "Melukhkha" or "Salt Desert" of the cuneiform inscriptions. In Gen. x. 29 and I Chron. i. 23, on the other hand, Havilah is a son of Joktan, associated with Sheba and Ophir in the southern portion of the peninsula. As, however, the Assyrian inscriptions show that the power of Sheba extended as far north as the frontiers of Babylonia, it is not necessary to transplant Havilah from the north to the south, more especially as Mesha (Gen. x. 30) is probably the Assyrian "Mas," the northern desert of Arabia. The Havilah of Gen. ii. 11 is certainly to be sought in this direction, since the Pison, which "compassed" it, was, like the Euphrates and Tigris, a river of Eden, the Babylonian "Edin," or the Chaldean plain. It is said that it produced gold, bdellium, and the "shoham" stone. This last has been identified by some Assyriologists with the "samtur" stone of the monuments, which was found in Melukhkha. Glaser makes bdellium the exudation of the balsam-tree. It is questionable whether the Cushite Havilah mentioned in Gen. x. 7 is to be looked for in Arabia or Africa. Arabian tribes migrated to the opposite coasts of Africa in early times. The fact, however, that Raamah, Sheba, and Dedan are coupled with Havilah is in favor of Arabia; and Havilah, like Sheba, might geographically be described as both Joktanite, or southern, and Cushite, or northern. 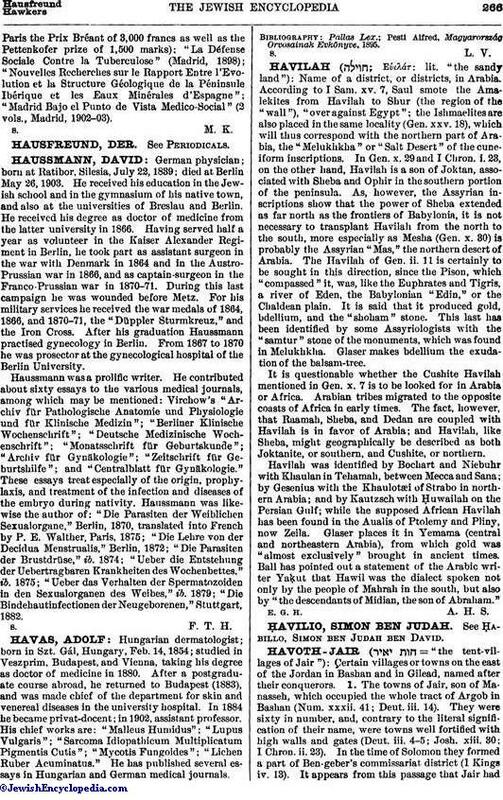 Havilah was identified by Bochart and Niebuhr with Khaulan in Tehamah, between Mecca and Sana; by Gesenius with the Khaulotæi of Strabo in northern Arabia; and by Kautzsch with Ḥuwailah on the Persian Gulf; while the supposed African Havilah has been found in the Aualis of Ptolemy and Pliny, now Zeila. Glaser places it in Yemama (central and northeastern Arabia), from which gold was "almost exclusively" brought in ancient times. Ball has pointed out a statement of the Arabic writer Yaḳut that Ḥawil was the dialect spoken not only by the people of Mahrah in the south, but also by "the descendants of Midian, the son of Abraham." E. G. H. A. H. S.